I&apos;ve recently noticed my ronin-s drifting after double-tapping the trigger. For example, if it&apos;s standing on a table and I double-tap the trigger to realign, it aligns put then slowly pans about 2-3 degrees to the left. I&apos;ve updated the firmware and attempted a joystick calibration. Thoughts? To further add to this...I just figured that if I hold down the trigger, it begins to pan very slowly to the left. Hi there, sorry to read on this, just to verify, when you press twice the Trigger to re-center the gimbal, it will keep drifting or it recognizes the center point 2-3 degrees to the left, did you try the system calibration? 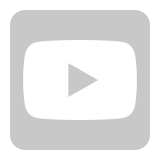 Any chance to show us a short video? Thank you in advance. Thanks for following up. Yes, when the trigger is double-tapped, it re-centers then drifts a couple degrees. Further, if I hold down the trigger it drifts (pans). Here&apos;s a link to a video describing it. I have this same problem. Holding down the trigger I experience panning to the left. Also, setting a user mode with smooth track turned off the gimbal drifts to the left (although not as fast or as far). I&apos;ve tried meticulously balancing the gimbal (test shows "excellent" balance). I do auto tune every time and have even tried calibrating the system and calibrating joystick. This is making it impossible to do hyperlapses. Mindy, any thoughts on this one? The issue has been forwarded to our engineers for further analysis, I will come back to you once I hear from them, please wait patiently, thank you. Hi Brian, sorry to know you have the same issue, the issue has been forwarded to our engineers for further analysis, I will come back to you once I hear from them, please wait patiently, thank you. Curious to see if there&apos;s been any updates from your engineers? 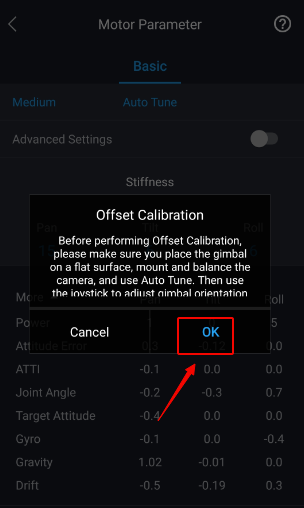 Hi all, sorry to have kept you waiting, the Ronin app V1.1.4 adds a joint angle calibration feature. Please see the operation process below to see if it helps. 1. First press the button twice to re-center the gimbal. 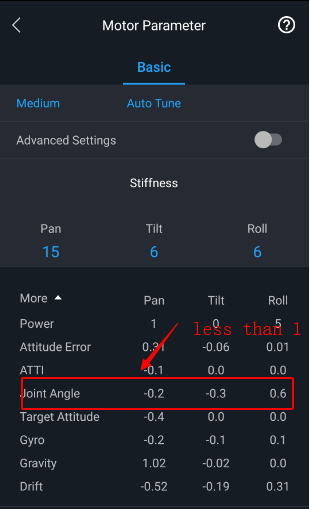 Then check the joint angle parameters under app’s “Motor Parameter”. If any joint angle value is above 1, or the axis arm drifts after the gimbal is re-centered, then joint angle calibration is needed. Please see the picture below: the pan axis’s joint angle value is bigger than 1, therefore adjusting the pan axis’s joint angle parameter is needed. 2. 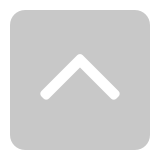 Push and pull the joystick several times to change the axis’s position if its joint angle value is above one or it has drifted. 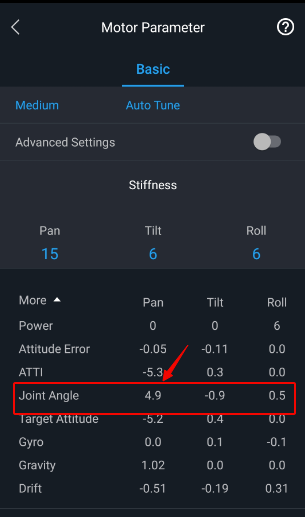 Observe the joint angle data changing in the app and stop operating the joystick after the value is less than one or the drifted axis’s arm is in the centered position. 3. 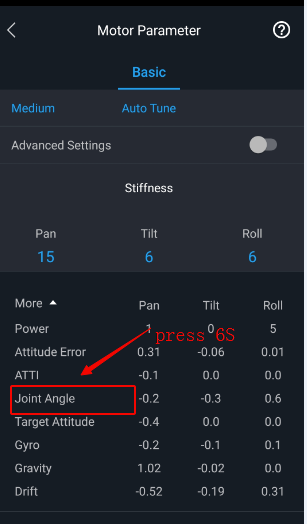 Press and hold the joint angle in the app for about 6 seconds to start the joint angle calibration. Then click “OK”. Thank you! Looks like we’re good now. i have the same problem, do you fix it ? I’m having the exact same issue. With the same results. The fix mindy suggested works temporarily but as soon as I turn off the gimbal or hit the recenter button it starts happening again. After testing and diagnosing your product, DJI will provide you with the free repair service. The repair is expected to be finished in 2 to 3 working days, then the product will be sent back to you. I am having the exact problem, no news? I have tried everything and spent a day trying to fix this issue but looks like no one can help us out...This is the last time I am buying from DJI. Hi everyone. I was having the same issue with the Ronin S. I might have found a solution. Test it out on your own device and let me know if it works for you as well. 4. At the top click on "More"
****Make sure you do NOT have any cables connected to the camera because they might be affected during this. 5. Click on "Balance Test"
6. Recenter the gimbal by clicking the trigger twice. 7. If it still drifts then click on "System Calibration"
This seems to work for me every time. Kind of a pain but better than a drifting gimbal.